*All prices include admission fee, rental skates and ice fee. *Any lost ticket will be charged HK$ 50 for replacement. *Token for the locker is available at the Cashier Counter of each HK$ 6. 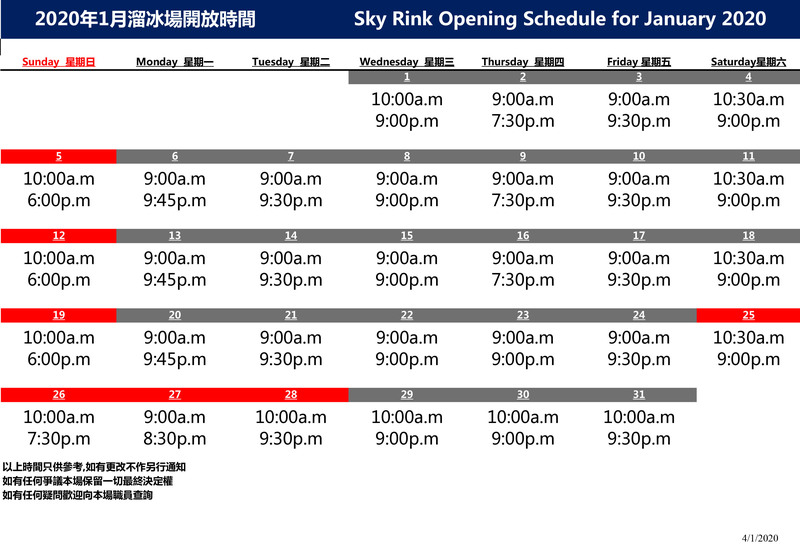 *Ice resurfacing on Mon thru Fri and Sun are scheduled at 12:00-12:30, 15:00-15:30 and 18:00-18:30. *Ice resurfacing on Sat is scheduled at 12:00-12:15,14:45-15:00 and 17:30-18:00. IN CASE OF DISPUTE, THE DECISION OF SKY RINK SHALL BE FINAL. Powered by kaiyau web design.